I've spoken at a quite a few churches over the last few years and have had even more conversations with ministers and pastors at churches. Most of these conversations have been about hospitality, about how we can create more welcoming and hospitable faith communities. One of the biggest obstacles to spiritual formation is this "reverie of lack," especially a felt lack of time, energy and resources. That's the mindset people are carrying into church where they will hear calls to be more missional or more hospitable or a more radical, committed and fired-up follower of Jesus. But do you know what the person in the pew is feeling when they hear all this? 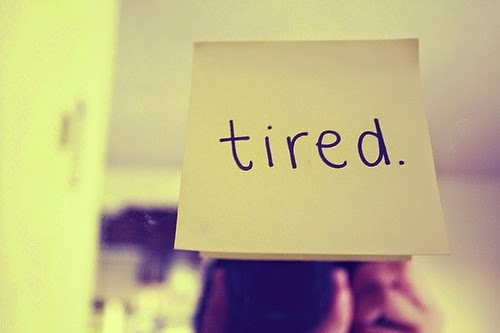 This: You're making me tired. All that sounds exhausting. Jesus = Exhausting. That's the equation created by the mindset of scarcity. That's the battle churches are facing when it comes to mission, ministry and spiritual formation. For example. People at a church might complain about not connecting at church and about being lonely. They express a craving for deeper, more authentic community. So the church hires a small group minister to invest in small group ministry. And then guess what? No one has time for small groups! That's a weekly commitment that people just don't have time for. We crave deeper community. We just don't have the time or energy for it. How many initiatives and ministries have been started up at churches--often at the request of members--only to have staff people standing around waiting for the members to show up? That's the paradox in many churches. Members and churches feel that they are spiritually sick and dying but no one has the time or energy to commit to the remedies, even remedies that we've requested and know that we need. In many ways, it's our exhaustion that has made us sick and it's our exhaustion that prevents us from getting better. So we cycle downward, deeper into a mindset of scarcity. More and more that's what I'm hearing from ministers, pastors and church leaders. We can't, they report, get our people to invest in the church, in ministries, in mission or in spiritual formation because our people report being exhausted, tired, stressed out and over-burdened. Governed by a mindset of scarcity the way of Jesus just sounds way too exhausting. For follow-up reflections to this post see first The Scarcity Trap and then The Therapeutic is the Political: Sabbath as Spiritual Warfare. Great points. What solutions have you seen that have worked in their particular context? I think we're missing something fundamental. We think we are doing the work when in reality its "Christ in me" who is doing and completing what He started. "Come unto me" He said. Labor ye therefore to enter into His rest. I'd reply...... but I'm busy right now! "Be still and know that I am God"? Training, like initiation rights that Richard Rohr is doing in Albuquerque? "The world needs places that equip individuals to serve with compassion, acknowledging our differences while valuing our one-ness. The Living School for Action and Contemplation provides such a course of study grounded in the Christian mystical tradition. Cultivating a contemplative mind through teachings and practices, students deepen their awareness of our common union with Divine Reality and all beings. Students emerge empowered to live out their sacred soul task in their homes, workplaces, and all relationships, within a more spacious stance that is at once critical, collaborative, and joyful." Good diagnosis, but diagnosis is not a cure - what are your thoughts on a cure? Some have asked about solutions or cures in the thread. Tomorrow's post moves in that direction. If scarcity is the the problem, than abundance is the cure. And the way of Jesus is abundance. I'm told we cannot serve two masters. Discipleship then is not the addition of anything. Adding another ministry, another mission, another book, another study, and another conference. It is the subtraction of everything else. What does it look like to denounce social status in America? It doesn't look like abundance. Not with my current vision anyway. Yet it seems to be just that. Or as Drew Sumrall has written quite well, "In (participating in) Christ (crucified) one does not become ‘something’, one remains nothing, but a ‘nothing’ that is humbly aware of itself, a ‘nothing’ paradoxically made rich through the very awareness of its lack." I'm reminded of the Andy Griffith episode in which a visiting minister preached a sermon on slowing down, taking it easy. Andy and the others decided to take his advice and resurrect the relaxing Sunday afternoon band concert...which turned into a nightmare. And, to top it off, when Andy asked the visiting minister, who had dropped by the house, to sit a while, his response was "I have to run". We do get caught up in the hamster wheel competition. We try to make our own prettier and faster, then complain "I'm tired, but I just can't jump off at anyone's beck and call". Being rested for the church is not produce by a church's educational program. It is born from those solitary moments we daily set aside for ourselves to listen for the divine whisper. Love this thought Richard- it rings very true to me. Can't wait for tomorrow's post! "For example. People at a church might complain about not connecting at church and about being lonely. ..... And then guess what? No one has time for small groups! That's a weekly commitment that people just don't have time for." This is EXACTLY what has happened at my church. I am one of the people who worked to set up small groups (though I am a layperson=not paid, so that differs from your example). It was infuriating to hear from people that they wanted more small groups and then have them not show up. And then that made ME exhausted, feeling like I was just spinning my wheels, or that perhaps it was me personally whom they didn't want to see. I am very curious to see what solutions you and others propose. Scarcity is the very nature of our (economic) existence, and is the reason economics as a discipline exists. It's just part of life. We have been talking about community, small groups etc at our church after a period of deprogramming and much of this rings a bell. We recognize that things should be different but we are busy and unsure how to disentangle from our regular pattern. Some things like work and parental responsibilities seem unavoidable so I'm looking forward to your followup. My guess is it has more to do with how we use our free time then on the actual demands we face. Not to mention (whether explicit or implied) profound spiritual pressure imposed by (in many cases) the very same churches - our alleged spiritual lack. Are we faithful "enough", trusting God "enough", saved "enough"? Doubts about personal salvation or being holy "enough" for God, obsession with the how-tos of hell avoidance can make one very, very tired - I know from personal experience. Is the scarcity mindset the result of rivalry or is rivalry the result of scarcity, or are both the dialectically inseparable sides of the same coin? I get frustrated by the make-believe solution to scarcity... Scarcity is a mindset, so believe instead in abundance and you will be alright... As if we could make up our beliefs and therefore our mindsets. Well, maybe those with no time realize, either inately or by experience, that church programs don't create real community. Involvement is not community. Lucy Van Pelt peddled involvement to Charlie Brown, when what he needed was sacrament to remind him of the truth. Only then could he cultivate love and community through the Christmas tree. Churches should be peddling sacrement which reminds people of the story, and teaches us to build community the real way. My daughter's favorite books are the Little House on the Prairie series. Last time we read through it I noticed with a bit of envy how agrarian life had such strong rhythms. Yes, they all worked ridiculously hard, but they always knew that dusk was coming, or winter, or whatever cyclical lull was up next. Our culture offers few such promises. The lights are always on and there is always as much to do today as there was yesterday, with no promise of anything different down the road. Thank you for this, and for so much else you write (I'm reading "Unclean" now) and for your constant hinting at what I am more and more convinced is THE Good News -- that with God there is enough and more than enough: enough food, enough time, enough love, enough Life itself that even death cannot diminish or defeat it. It takes a real leap of faith to "repent" -- drop all our normal habits of thought -- and BELIEVE this Good News. If we really believe it, even for a few minutes at a time, we can stop being afraid, and stop seeing anyone as our enemy, and everything changes. The Sermon on the Mount suddenly makes sense, and indeed seems obvious. Same with the Parables. The central position of the miracle of Loaves and Fishes in all four Gospels suddenly becomes clear. And what a challenge to the central principles of consumer capitalism, all based on perceived scarcity, and to-the-death competition. When we focus on God there is no scarcity, when we focus on ourselves there is never enough. Two things have stood out about this article. The first is that Christians are great at starting things and very often hopeless at knowing when top pull the plug on an activity, and thye other is the comment by Rick, below, that Yeshua had more demands on His time than any of us, but He only did what He knew His father required. Maybe we are just too afraid of hurting someone's feelings in the here and now that we are willing to harm them in the eternal. The only thing I really agree about this article is that our mindset really does affect our lives. I can't begin to tell you how timely this is. I have been preaching on the spiritual disciplines. This Sunday is 'simplicity.' I am increasingly convinced that for many, Christianity is another 'item' on their plate much like a vegetable at a cafeteria. They go through life, picking what they want and then get a 'little side of Jesus' because it would be 'good for them.' They never experience the abundant life because a 'little bit of Jesus' isn't enough to make an identity on. i think addictions are at the core of fear of not having enough. an addicts main activity is 'protecting supply' what happens in recovery is the development of empathy & honesty. These things are missing in an addicts life b/c the person has disappeared into an activity and is unavailable for anything else.